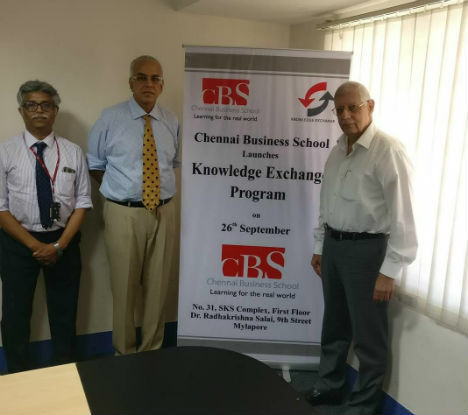 Chennai: Chennai Business School announced the launch of “Knowledge Exchange” a fresh approach in this practice of meaningful interaction with industry. Knowledge Exchange is a very deeply involved practice in which CBS will identify industry wide challenges and provide well-researched and sustainable solutions. Interacting with media, Mr. J. N. Amrolia, CEO & Founding Director, Prof. Sridar Natarajan, Dean, Mr. K. Krishnan, Governing Council ,CBS explained about this unique initiative ehich is the first of its kind. Previous articleDr. O.P. Bhalla Foundation & Jeevandayini conducted a Bone Marrow Donor Registration Drive with a record 93 donor registrations at Manav Rachna campus!